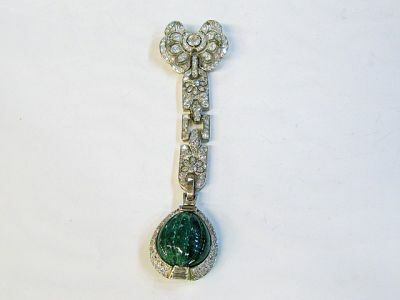 A stunning Art Deco platinum stylized butterfly motif brooch, featuring 1 carved fluted emerald bead, approx. 18.50ct; 1 old European cut diamond, est. 0.25ct; 3 straight baguette cut diamonds, est. 0.30ct; 23 old European cut diamonds, est. 1.50ct and 177 single cut, old single cut and old European cut diamonds, est. 4.00ct. The diamonds are graded - (clarity; VS1-SI2 & F-G-H colour). The brooch is approx. 9.5cm ( 3.75 inches) long.